As we approach the close of another year, it is time to take steps to maximize your financial situation for this year and start planning for the year ahead. Here are 10 must do tips to end your year (and your wallet) with a bang! 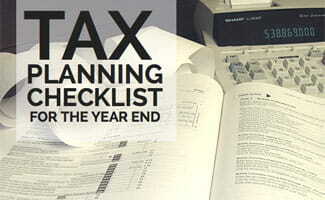 Naturally this year-end tax planning checklist is not all-inclusive, but it is a helpful starting point. It is my wish that you have a financially organized end of the year! If you are older than 70 ½ and/or you are the owner of an inherited IRA account, make sure that you have taken your Required Minimum Distribution (RMD) from your IRA or qualified retirement plan for 2014. If you have a taxable brokerage account, review the realized taxable gains/losses for 2014 and evaluate whether it would be beneficial to harvest tax losses. Remember that you may also deduct up to $3,000 in capital losses against your earned income each year. In other words, an ideal situation would be for you to finish the year with a net capital loss of -$3,000 in your investment account. That would mean all of your gains have been negated by losses AND you have an additional $3,000 in capital losses that you can deduct against your earned income. Each person is permitted to gift up to $14,000 a year to another individual and not have it count toward your lifetime gift exemption. This $14,000 gift is called the “annual gift tax exclusion amount.” If you are a married couple filing jointly, you may gift up to $28,000 combined to an individual. If you have children in your life whose educational futures you would like to help fund, consider starting a 529 College Savings Account. If you already have one for benefit of your child or grandchild, you may want to consider requesting that relatives make holiday gifts directly to the account or that they gift cash to the child to be deposited into the 529 account. Make the most out of your remaining 401(k), 403(b), Simple IRA, etc. contributions by the end of the year. If the plan is sponsored by your employer, all contributions must be made by the end of the calendar year. On the other hand, if the account is a SEP-IRA, Traditional IRA, or Roth IRA, you have until April 15th (or when you file your income taxes, if earlier) to make your contribution. Consider increasing your 401(k) contributions in 2015 if you do not already max them out. For 2015, the salary deferral limit will INCREASE, from $17,500 in 2014 to $18,000 in 2015. Additionally, if you are age 50 or older, you may also make a catch-up contribution in the amount of $6,000 bringing your total to $24,000. Research and enroll in a health insurance plan for 2015,either through your employer or individually. If your employer offers the option to do a Flexible Spending Account or Health Savings Account, consider whether those would make sense for you. Different rules apply but both allow you to put pre-tax money into a savings account that can be used for qualified medical expenses. Rules have recently changed for FSA accounts, and participants will now be allowed to carry over up to $500 in unused funds into the next year. For more information on these plans, please see IRS Publication 969. For charitable contributions to potentially apply to your 2014 tax return, they need to be submitted by the end of the calendar year. Make sure that the charity is a qualified 501(c)3 tax-exempt organization that is eligible for tax-deduction of contributions. Create a folder to hold all of your tax-related documents as they begin to come in so they will all be in one place when you need them. Consider using financial budgeting software like Quicken or the free Mint.com to track your expenditures and develop a budget for 2015. These programs allow you to download information from all of your accounts: bank, mortgage, brokerage, IRA, credit card, etc. so that you may categorize the expenses and income for tracking purposes. It can make your life a lot easier come tax time. Do you have any year-end tax tips that we have not included?